First off, the City of London is not to be confused with Greater London. It is a single square mile containing The Tower of London, St. Paul’s Cathedral, The Monument (to the fire of 1666 – an iconic event in the history of insurance) and several distinctive buildings housing global insurance companies. 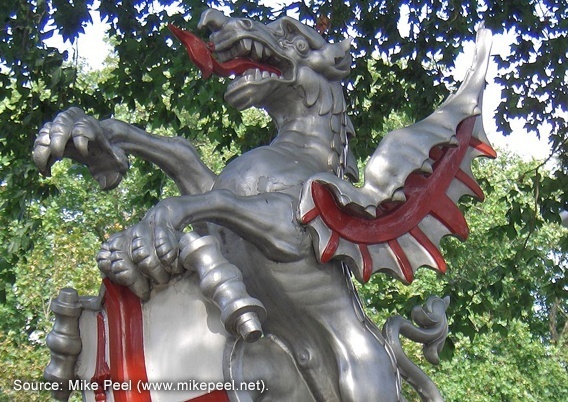 Most approaches to the City are marked by silver dragons.  Now that we've got that straight.... let's begin our tour. 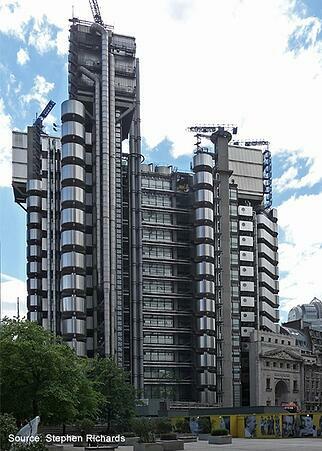 Any survey of London insurance needs to start with Lloyd’s, and the topic of architecture is no exception. 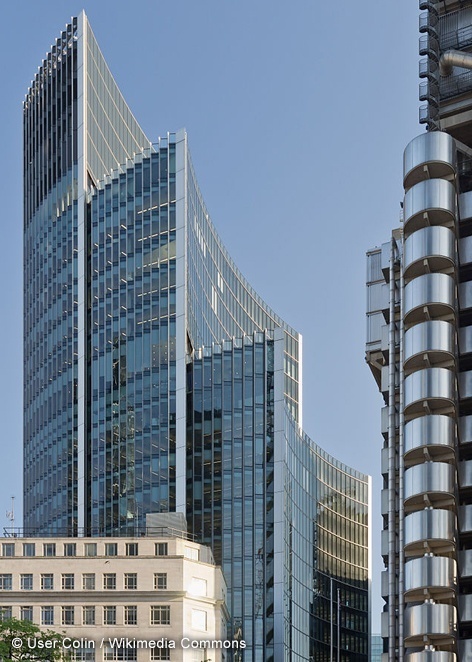 The Lloyd’s Building (1 Lime Street), designed by Richard Rogers, is an architectural icon and a leading example of Bowellism (where all the services are on the exterior). It remains the youngest building to receive Grade I listing from English Heritage. When it was completed in 1986, there were no other buildings in the City of London remotely resembling it, with its space age, ultra-modern look. The design of the building is inspired by the function within. Lloyd’s is a global marketplace, and having the services located on the exterior creates an open interior that allows the members, agents, and brokers to engage in their daily business in a space reminiscent of an open-air market. All is not space-age and modern bustle, however. The Adam Room occupies the top floor, and offers a meeting space rich in decoration and pomp. 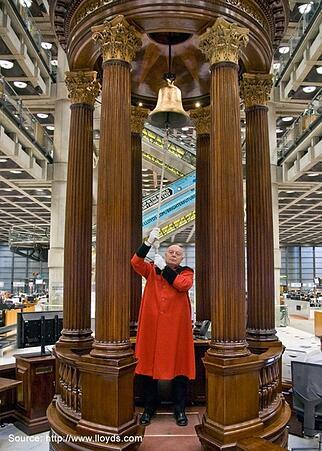 And history has not been neglected at Lloyd’s: The Lutine Bell resides in the main Underwriting Room. The bell was cast in 1779 for the French frigate Lutine (later, the HMS Lutine), which was wrecked in 1799. The bell was brought to Lloyd’s upon its salvage in 1858, and was rung upon news from overdue ships until 1989. The most famous silhouette of an insurance building in the City is surely The Gherkin (30 St. Mary Axe), designed by Norman Foster. 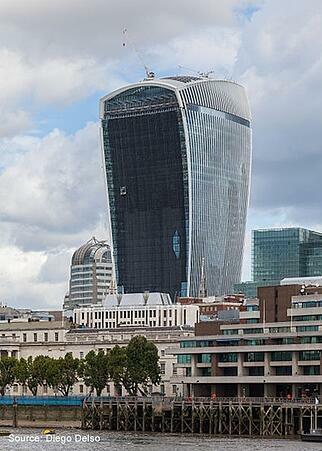 Widely derided by Londoners when it was completed in 2003, it quickly endeared itself with its pickle-shape. The building was commissioned by Swiss Re, and many in London still refer to it as the Swiss Re building. Today, Swiss Re remains in a few offices, along with several other insurers such as Allied World and Standard Life. 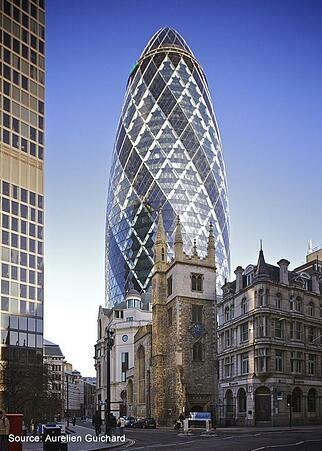 The Gherkin was an early entry into the imaginative shapes that are now becoming more prominent on the City skyline. Another building by Norman Foster is The Willis Building (51 Lime St.), an elegant skyscraper across from the Lloyd’s Building. The Russian-doll silhouette was added to the London skyline in 2008, and heralded the continuation of modern high-rise architecture in the City. Willis has always been the principle tenant of the building. 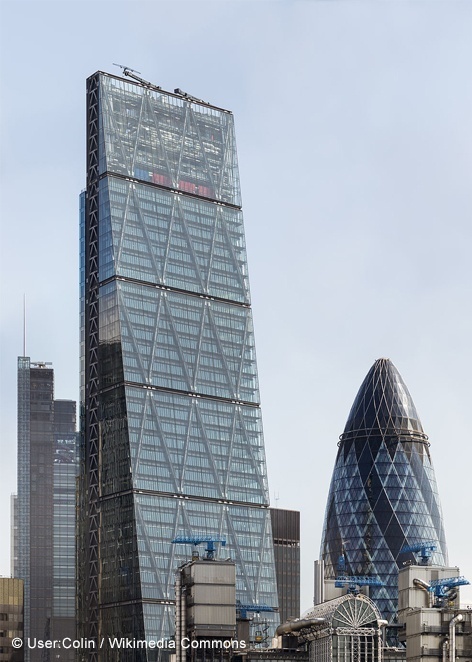 A recent addition to the insurance-related architecture scene of London is the Leadenhall Building (122 Leadenhall Street), or as it was dubbed from the drawing board, the Cheesegrater. The building was designed by Graham Stirk. Upon completion in 2014 it housed Aon’s global headquarters, along with Amlin. The distinctive slant of the building ensures that the view of St. Paul’s remains clear when seen from Fleet Street — the building is leaning out of one of the most photographed views in London. And the newest inclusion to the collection is Rafael Viñoly’s “Walkie Talkie” Building (20 Fenchurch Street). Completed in 2014, it now houses several insurance companies, including Tokio Marine, Kiln, Ascot Underwriting, RSA, Allied World, CNA Financial, Liberty Mutual, and Harry Townsend Corp. The building offers a public green space on its top floors, with a bar and two restaurants. The building made headlines in 2013 when the south-facing convex façade focused sunlight onto the street below, damaging a few parked cars and a welcome mat. Of course, it was dubbed the “Fryscraper” after that episode. Over the past few years, insurance has proven to be a wonderful guide to the world for me. This business spans all countries, and the companies conducting the business are as global as any others. Perhaps I will explore other cities or countries through the lens of insurance-related architecture in future posts.